The programs, activities and events supported by the Catholic Family Sharing Appeal are making better and more disciples in the Diocese of Sioux Falls. That is probably not what is on the mind of most donors when they consider their gift to the annual diocesan appeal, and it surely is not on the mind of the youth and young adults deepening their faith at discipleship activities. But there is plenty of good evidence that it is happening. Take Grace and Phil Eisenberg for example. Grace grew up in Aberdeen, Phil in Sioux Falls. Both attended a wealth of discipleship activities – Totus Tuus, Discipleship Camps, Youth Rallies and retreats. They even met at one of them. Today they are a young married couple active in their faith. Grace teaches at St. Mary Catholic School, Sioux Falls and Phil is the finance and operations manager at the Cathedral of Saint Joseph. “Discipleship is about coming to know Jesus Christ in a deeper and more personal way,” said Bishop Swain. in the parishes, but it is always about leading us closer to Jesus Christ,” he said. “And it is the work of all of us – our baptismal call – to evangelize,” said Bishop Swain. “By supporting the Catholic Family Sharing Appeal you are participating in evangelization and helping form disciples,” he said. This year’s Catholic Family Sharing Appeal kicks off on the last weekend of February and as usual coincides with the beginning of Lent. The Appeal funds a wide range of diocesan ministries, and parishes also benefit by retaining donations that exceed the parish goal. “I don’t think I would be where I am if it wasn’t for these different programs that the Catholic Family Sharing Appeal supports,” said Phil Eisenberg, who said his faith-filled Catholic family encouraged him to attend youth conferences, discipleship camps and more. “But it was once you are there and you experience it … out of that grew a confidence and a love, for Christ above all, but for the ministry of Christ’s church. Out of that comes the desire – I want that for my life,” he said. Grace Eisenberg said her experiences with discipleship-related programs in her growing up years directly led to her desire to teach in a Catholic school. “If I would not have experienced the community and the life that a freshman in high school can experience at discipleship camp I would never have been convicted to go into a job that (someconsider) sacrificial,” she said. Operation Andrew dinners to the list. “These things provided the opportunity to think about my faith and to think about what God might be calling me to at the time,” he said. Now in hindsight, he sees how those experiences laid a foundation not only for his vocation, but also in his current work as a pastor. “Teaching in the Totus Tuus program taught me how to teach and it’s one of the things a pastor needs to do…some of these things have helped me transmit the faith in a better way. It’s an acknowledgment that as a priest I’ve grown in my own prayer life and experiences – the foundations were laid years ago, and I’m still building upon them,” Fr. Urban said. The Catholic Family Sharing Appeal provides funds for much more besides discipleship programs, including seminarian education and Newman Centers. Edann Cloos, originally from St. Charles Parish, Big Stone City, attends Northern State University and has found a home at St. Thomas Aquinas Newman Center. As a transfer student she missed out on the usual orientation activities where one meets other students. “The Newman is really how I got to know a lot of people. The Focus team was really awesome introducing me to people and the campus minister signed me up for everything,” Cloos said. “Knowing that you can go there any given day and any given hour and there is someone there … a friend that you always have. I also joined the bible study which was really cool,” she said. Like the Eisenbergs, Cloos had years of experience with Totus Tuus at the parish level, discipleship camps, youth rallies and retreat programs like Search. She said those events were particularly helpful to her coming from a small parish with few people her age. “It’s just really nice to know that you don’t have to come from a big town to be part of the faith family. You don’t have to be from Sioux Falls to be part of the Sioux Falls diocese. That took me a long time to figure out,” Cloos said. But what does that mean to her ongoing faith life to have made connections and developed friendships through these Catholic Family Sharing Appeal supported discipleship events? “My friends from the youth events definitely lead me closer to Jesus and challenge me in new ways to grow in my faith,” she said. Cloos said having all the various discipleship experiences in her background made a huge difference last year when she was struggling. “I needed Jesus and I signed up to be a D-Camp counselor, and while there signed up to do to Search and now I’m directing a Search in March. I’m so thankful that it’s something I turned towards when I was struggling. I’m so grateful those things are there and I’m not the only one who struggles and needs them,” she said. Grace Eisenberg had a different view of Newman ministry from her childhood years watching her mom, Kayla Heller serve at St. Thomas Aquinas. “For all of my growing up I was able to experience this Catholic world of college-age students who really cared about me and my family. And I got to see my mom work in that way with her faith,” she said. “Seeing the community that comes with the Newman Center, and then when I got to junior high there was youth group which fed into all the discipleship activities … having all those things available to me really changed my life and made me want to pursue my faith for the rest of my life, to discover it and grow in it,” Eisenberg said. Now in her 4th year as a Catholic schoolteacher, she is also sharing it. Whether from a large or small parish, your parish priest is one of the most visible signs of the work of the Catholic Family Sharing Appeal. Seminary education and formation receive significant support from the appeal. “There is no better sign than when you go to Sunday Mass and you see the priest … that priest is up there because of your gift,” said Phil Eisenberg, who spent time discerning his own possible priestly vocation. Though discernment lead him away from the priesthood, the time in seminary only enhanced his love of the Church. “Post seminary, post discernment about priesthood I was praying about what God wanted me to do and it kept resonating that I loved the Church and wanted to be part of its activities,” said Eisenberg, who is in his 9th year at Cathedral. He uses all his various discipleship experiences in his work and he relishes the opportunity to share them with others. “I meet young people in the parish and I can kind of point them in various directions … those different programs cover so many aspects of the diocese and diocesan life,” he said. “I think the Catholic Family Sharing Appeal is the thing that really helps parishes get traction and move ahead. You look at a parish and all the people that are involved and make it work … they have been formed by all these programs. It all works together in harmony and at the parish – where the boots are on the ground, the wheels are turning thanks to the gifts to the Catholic Family Sharing Appeal,” he said. “I think what our diocese has done is provide a good support system for parishes whether they are big or small. As a priest I feel supported by all the ministries, and I try to reap the fruits from them but also contribute to them as well,” he said. An example that extends beyond the discipleship programs is preparation for the Sacrament of Marriage. Couples work with their parishes of course, but marriage preparation is supported at the diocesan level in a range of ways, including the FOCCUS, an instrument used to help couples discuss important topics. The Eisenbergs, married less than two years ago, worked with their pastor and among other preparations for the sacrament, attended Engaged Encounter which helped them communicate better. “It tackles those tough questions and it was hugely important for us … to discuss those topics that we didn’t even know we needed to discuss … it was really helpful for us,” said Phil Eisenberg. Fr. Urban also references many other Catholic Family Sharing Appeal supported ministries as benefiting his work as a priest, which includes years as the diocesan master of ceremonies. “In those years I was in and out of the office regularly, working with communications or IT and as a parish priest I reference other offices like the Marriage Tribunal, Catholic Family Services…also the Vocations Office and the Finance Office. It is a good resource for our parishes, answering questions about a lot of things I’m not an expert in – I can rely upon their guidance,” he said. “The Catholic Family Sharing Appeal is meant to help us look at the bigger picture of what the diocese offers us – even though we might not partake in all of the ministries that are offered, we contribute financially so that someone can take advantage of them. And I think that helps us understand that as one parish or a couple of parishes that we are a small part. Cardinal (John Henry) Newman uses the verbiage of being a link in the chain – we are all unique links in that chain but important as well,” Fr. Urban said. The baptismal call given to each person invites us to become disciples and to support the work of forming disciples through opportunities like the Catholic Family Sharing Appeal. “The experience of being formed as disciples leads us to share our love for Christ and his Church – which is precisely what discipleship is about – coming to know Christ more deeply and knowing that we need to share that love with others,” said Bishop Swain. “While many of our programs focus on the young since they are our future, becoming a disciple can happen regardless of our age. I encourage you to seek your own development as a disciple,” he said. The forming of disciples is not something that happens immediately, it happens over time through various experiences, circumstances and opportunities. Your gift to the Catholic Family Sharing Appeal assists with providing these programs and ministries to allow the Holy Spirit to work. 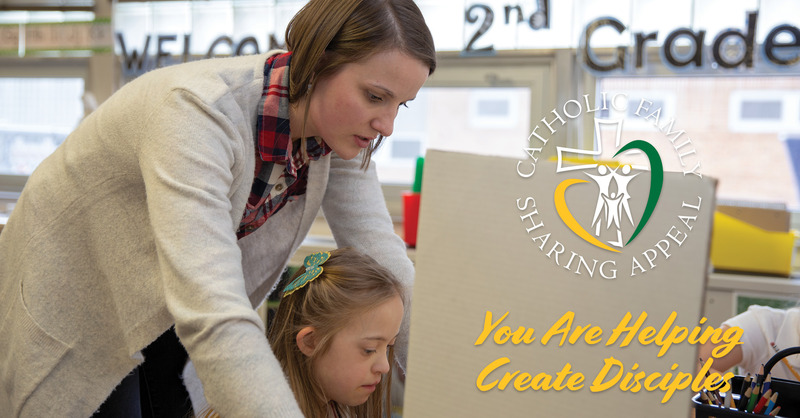 The question is often asked, “what is my donation doing?” or “How is my gift making a difference?” If you are reading this publication, which allows us to tell how the Holy Spirit is working in our diocese, you helped make that happen through your gift to the Catholic Family Sharing Appeal. As Catholics we come together every weekend as one, holy, Catholic and Apostolic church to give praise and thanksgiving to God for the gifts He has given us. Likewise, we are asked to return these gifts to the Lord. The Catholic Family Sharing Appeal is the one time each year we come together as one family to give in a prayerful, sacrificial way that allows the Holy Spirit to work in and through each of us in an extraordinary way. What we accomplish together is greater than any one person or parish could do alone. Each of us, when participating in the Catholic Family Sharing Appeal help to continue building God’s Church – helping us all be disciples through youth events, Newman centers, grief counseling, TV Mass, prison ministry and so much more. Your financial gift and gifts of prayer continue to changes lives just like the stories told in this edition of the Bishop’s Bulletin. Please prayerfully consider how you are being called to participate within your parish to support the ministries of the diocesan church. If you would like more information on which ministries are supported through the Catholic Family Sharing Appeal or how the parish share is developed visit www.sfcatholic.org/cfsa.